Please be reminded that there are no rehearsals tonight (April 21), though we will see our Sunday cast members at one of our other rehearsals this week (Mon-Thurs from 7pm-9pm)! Hope everyone has had a great long weekend and see you all this week! As per some confusion regarding the number of costumes required for some JUNIOR members, and whether there are different costume requirements for Act 2, please see below. As for the Ensemble, you are all Agrabahns. Only one costume is required for Ensemble/Agrabahns. This is the same for Shop Owner, Fortune Teller, Apple Vendor, and Beggars as well. The Attendants become a part of the Ensemble/Agrabahns in Act 2. Their basic costume is the same for both Acts; MYTP will be providing additional pieces for Act 1, and then they can add a vest and/or sash in Act 2, if they would like. As well, if you are still having trouble finding costumes in general, please be sure to look at the website on a desktop as there are some links to outfits that may not be as visible on a mobile device. Though, anyone that is still searching, try looking at local thrift stores and shops in town beyond looking online. We hope this clears any confusion up, if not please contact Andrea at theatremum@gmail.com. Aladdin Jr. Cast Party Announcement!! Lights, Camera, Action! 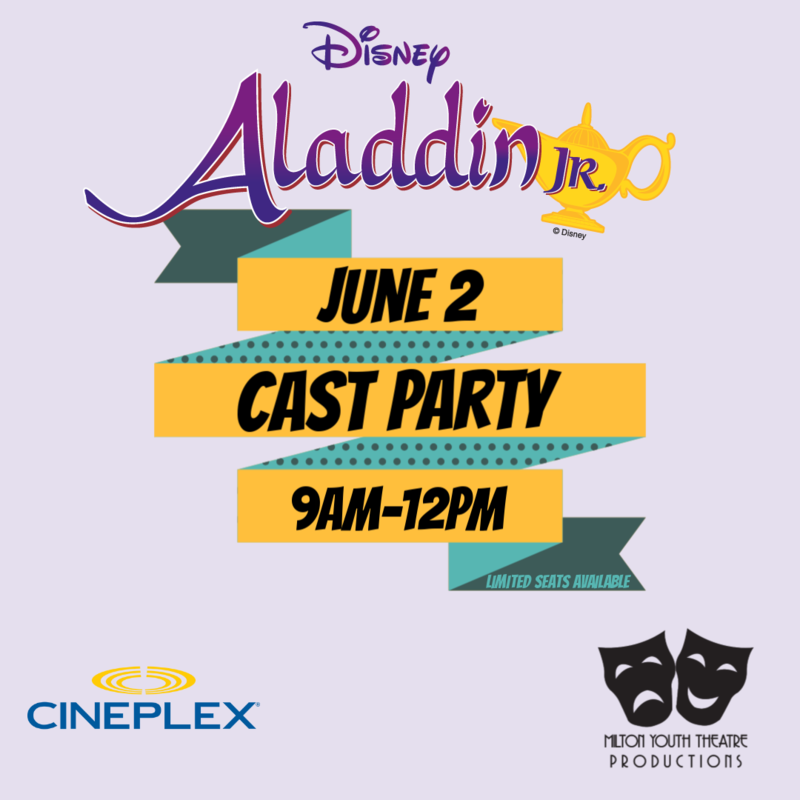 For this season’s Cast Party we will be having a private viewing of Disney’s Aladdin at the Milton Cineplex on Sunday June 2nd 2019! All cast members are invited, however there is a ticket cost of $5.00 each. As seats are limited, it is first come, first serve; no seats will be held without payment. Tickets can be purchased via cash, cheque (made out to MYTP), or e-transfer. Shining Star and Mini Star members (4-8yrs) are required to have one parent/guardian (per family) accompany them (ticket required). As of Thursday April 25, 2019, remaining tickets will be available to parents of other cast members and the Family and Friends cast to purchase! The concession stand will be open and discount vouchers will be given out with your admission ticket. Milton Cineplex will open at 9:00am on Sunday June 2nd, 2019, and the film will start at 9:45am. This is a reminder to all JUNIOR members in Aladdin Jr. that everyone needs to bring in a parent/guardian to the beginning part of rehearsal this week. If there is no parent/guardian representative at rehearsal, the student will not be given their script to take home. Hope you had a great weekend and see you this week! Well, High School Musical has officially closed in the theatre and we would like to congratulate everyone on a wonderful performance, show week and season! Join us for our final Cast Party on March 3rd @ Country Heritage Park (please see the members only newsletter page for more details). Also – as we close one show, we are about to begin our next! Aladdin Jr. rehearsals will be starting the week of March 3rd. Please see the members only newsletter page for the first newsletter of the season! If anyone feels unsafe travelling in the current weather conditions, it is okay if you cannot make it in and will not affect any other shows/calls. The show will still be happening and will be a beneficial call for anyone who can make it in, but we understand if you cannot. Thank you and again, please be safe out there.